So far resident experience has been great! Good communication with property manager, nice community and pet friendly! The propert is conveniently located to shopping and other locations. Thank you so much for the 5 star review, Paula! We appreciate the kind words, and let us know if you need anything! Thanks again! Amanda, we're glad that you love living here! We appreciate the kind words, and we look forward to seeing you at renewal time! Thanks again! Love it! Super quiet, very helpful office staff, and beautiful quaint apartment. I enjoy the quiet outdoor space despite it being an apartment. Maintenance is fast and does good work as well. Thanks for the great review! We appreciate the kind words, and I'll let maintenance know to keep up the good work! Great neighborhood in a great location! Neighbors are very friendly. Office staff are extremely polite and professional. I would recommend living here to anyone. Thank you for the 5 star review, Ashleigh! We're glad you love the apartment and the location. We will pass along the compliment to the office staff as well and we're glad you're our neighbor! Hi Shelby! Thanks for the great review! We love having you and your family here as a part of our community! Our apartment is very well laid out. I love the wood floors in the main rooms. It’s nice to have two separate bathrooms as well! Rooms are a great size. Location is convenient to many stores! Great schools! Grounds are very well kept! Hi Jennifer! Thank you for the great review! We're glad you love our renovated apartments, and we hope you continue to love living here! Gary made the introduction to the community and move-in process lovely and welcoming. The apt and community is comfy, quaint, spacious, and quiet. Jamie, thank you for the kind words! 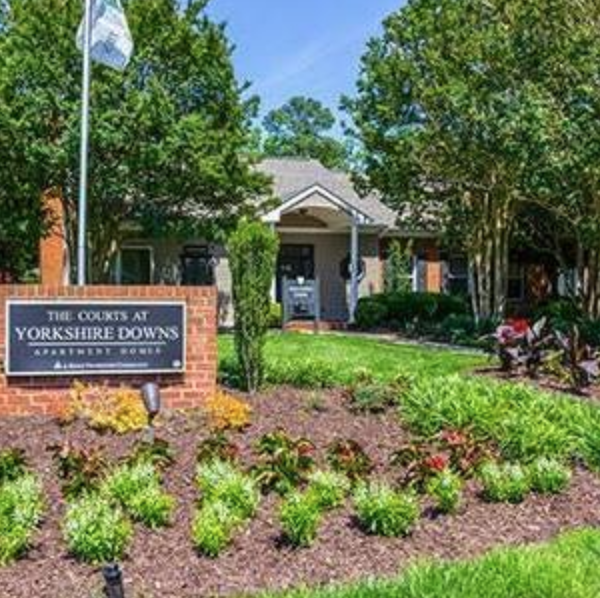 We're glad you chose our community, and we look forward to seeing you around the neighborhood. Welcome home! If you are not residing at Yorkshire Downs then you are not at home! The whole staff goes out of their way to ensure 5hat your needs are satisfied as much as possible. Ernise! You rock! Thanks for the great review! I love living here. The staff is friendly and helpful and the neighbors are wonderful! Safe and clean living! There is even a wonderful little dog park for my little Scooter to play in! Thank you for the great review, Marie! We're glad that Scooter loves the dog park as much as we love you both! All around great living experience. It’s my 4th apartment and it is by far the most peaceful experience I’ve had since moving out on my own at 18. Conor, thank you for the great review! We're glad your move in process was easy and peaceful, and we hope to see you around the neighborhood! Love how friendly and helpful the staff is. So far they have really made us feel at home and have even given my pet a treat while we worked on our application. Cristina, Thank you for the kind words! We're so glad you and your family chose our community, and let Hazel know whenever she wants some treats she's more than welcome to stop by the leasing office! We love living here at Yorkshire ! Safe and quiet neighborhood. Me and my family feel at home and I know everyone who will come live here will love it! The staff is professional, friendly and courteous. Any requests are promptly attended to. Then compiles is nearly maintained and kid friendly. We’ve lived here for about 3 years now and it’s such a serene community. The staff is superb. They’re always happy to help you with anything that you’re having issues with. They always ask for feedback as well which is nice.